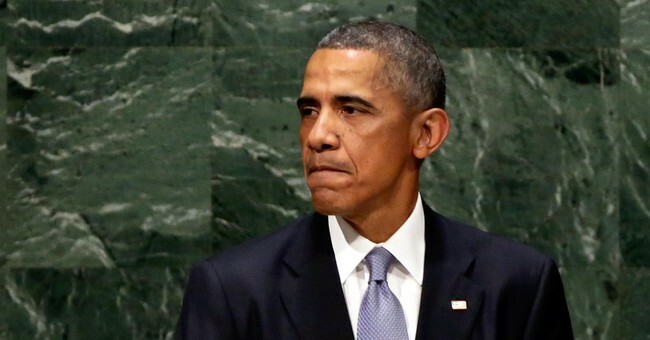 During his address to the United Nation's General Assembly yesterday, President Obama repeatedly made it a point to stress how Islam is a religion of peace. In making his case, Obama cited Sheikh bin Bayyah as a moderate. "We have reaffirmed again and again that the United States is not and never will be at war with Islam. Islam teaches peace. Muslims the world over aspire to live with dignity and a sense of justice. And when it comes to America and Islam, there is no us and them, there is only us -- because millions of Muslim Americans are part of the fabric of our country. So we reject any suggestion of a clash of civilizations. Belief in permanent religious war is the misguided refuge of extremists who cannot build or create anything, and therefore peddle only fanaticism and hate," Obama said. "Look at the new Forum for Promoting Peace in Muslim Societies -- Sheikh bin Bayyah described its purpose: 'We must declare war on war, so the outcome will be peace upon peace.' Look at the young British Muslims who responded to terrorist propaganda by starting the “NotInMyName” campaign, declaring, 'ISIS is hiding behind a false Islam.'" In a story published last night, The Free Beacon's Adam Credo points out that Bayyah is anything but a moderate and backed a fatwah of American troops in Iraq. Or in other words, called for their slaughter. Bayyah wants the same for Jews and Israel. Bin Bayyah himself has long been engulfed in controversy for many of his views, including the reported backing of a 2004 fatwa that advocated violent resistance against Americans fighting in Iraq. This is not the first time that the Obama administration has extoled Bin Bayyah, who also has served as the vice president of a Muslim scholars group founded by a radical Muslim Brotherhood leader who has called “for the death of Jews and Americans,” according to Fox News and other reports. Additionally, the notorious 2004 fatwa permitting armed resistance against U.S. military personnel in Iraq reportedly stated that “resisting occupation troops” is a “duty” for all Muslims, according to reports about the edict. In Obama's words, are these actions Bayyah's way of "aspiring to live with dignity and a sense of justice"? Pro-tip: When you're making a case for moderate Islam, it's probably best not to cite a radical who wants to see Americans killed. The fact that Bayyah has been advising the Obama administration for years is extremely alarming. "Moderate" Muslims from other radical groups tied to terrorist organizations, like CAIR, are also regular visitors to the White House.